Interactions with the bacterial community are increasingly considered to have a significant influence on marine phytoplankton populations. 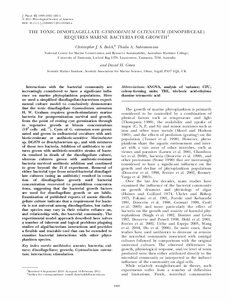 Here we used a simplified dinoflagellate-bacterium experimental culture model to conclusively demonstrate that the toxic dinoflagellate Gymnodinium catenatum H. W. Graham requires growth-stimulatory marine bacteria for postgermination survival and growth, from the point of resting cyst germination through to vegetative growth at bloom concentrations (103 cells.mL-1). Cysts of G. catenatum were germinated and grown in unibacterial coculture with antibiotic- resistant or antibiotic-sensitive Marinobacter sp. DG879 or Brachybacterium sp., and with mixtures of these two bacteria. Addition of antibiotics to cultures grown with antibiotic-sensitive strains of bacteria resulted in death of the dinoflagellate culture, whereas cultures grown with antibiotic-resistant bacteria survived antibiotic addition and continued to grow beyond the 21 d experiment. Removal of either bacterial type from mixed-bacterial dinoflagellate cultures (using an antibiotic) resulted in cessation of dinoflagellate growth until bacterial concentration recovered to preaddition concentrations, suggesting that the bacterial growth factors are used for dinoflagellate growth or are labile. Examination of published reports of axenic dinoflagellate culture indicate that a requirement for bacteria is not universal among dinoflagellates, but rather that species may vary in their relative reliance on, and relationship with, the bacterial community. The experimental model approach described here solves a number of inherent and logical problems plaguing studies of algal-bacterium interactions and provides a flexible and tractable tool that can be extended to examine bacterial interactions with other phytoplankton species.